Anyone still confounded by the explosive popularity of the Jonas Brothers clearly isn't listening. At least not with the avidity of a certain kind of teenage girl or grown woman who once swooned over Hanson, 'N Sync, Rick Springfield, Frankie Avalon - insert your own era's heartthrob here. On their smart little rocker of a third album, "A Little Bit Longer," out this week, Nick, Joe, and Kevin Jonas offer up the ideal, non-threatening fantasy boyfriend for our macho rock and hip-hop times. Even as they get older and more famous - and linked with this or that Disney Channel star - these are not young men flexing their muscles of dominance. On "Longer," when they're not confessing to becoming crazed puddles of goo when confronted by the girl of their dreams ("Got Me Going Crazy"), they're pledging loyalty ("BB Good") or begging for forgiveness ("Sorry"). And if forgiveness isn't granted, well, it's just as well since whichever brother happens to be singing didn't deserve that love, anyway ("Can't Have You."). For women, what's not to love? Luckily, the New Jersey trio also continues to bolster its puppy-love perspective with an increasingly substantial brand of power pop that grows more palatable to the general population with each release. As astute students of their genre, the brothers make sure the uptempo tunes move at a brisk pace. They pause only long enough to establish melody, hook, economical riffage, and basic plot, which generally runs along the lines of "girl, I need/want/dig you." No matter how much heaving enunciation is put into them, the ballads become increasingly less successful because all that sensitivity starts to read as wimpy when you replace slash-and-burn guitars with pianos and cellos. And the weird stab at pairing soul and angst rock - the George Michael-meets-Daughtry "Can't Have You" - is oddly discomfiting. 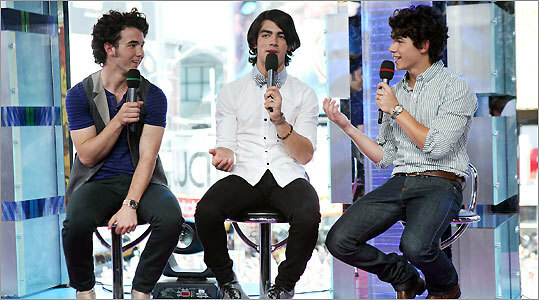 But "Longer" is a real milestone for the Jonas boys as they cross over from Radio Disney to Top 40. There is plenty on this third album that any honest pop music fan over age 30 (and of either gender) could appreciate, guilt-free.